Doctor Who Magazine have sent DWO the cover and details for Issue 537 of DWM. 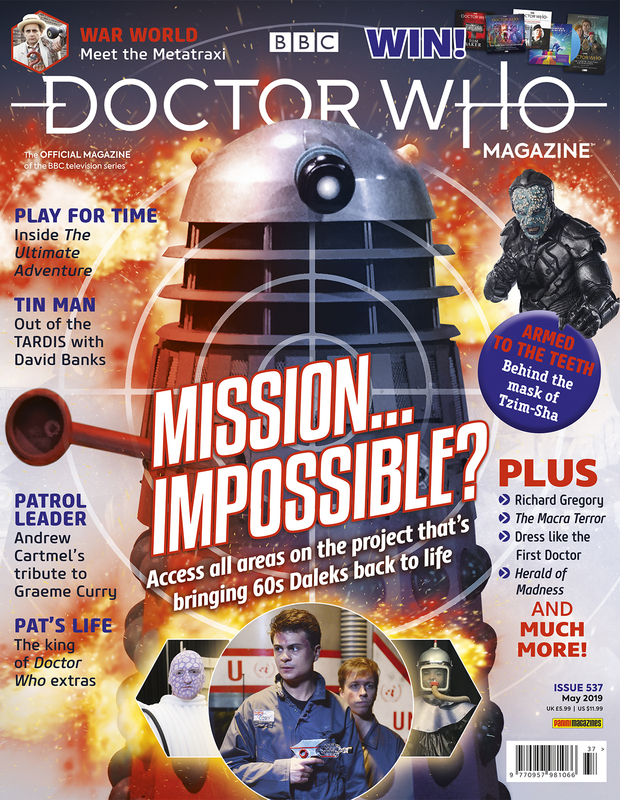 DWM Issue 537 reveals the remake of Mission To The Unknown! • What does it takes to become a Stenza warrior? Actor Samuel Oatley explains. • An interview with the man behind the new version of Mission to the Unknown. • Colin Baker and the cast of The Ultimate Adventure look back on the Doctor Who stage play. • Backstage with Colin Baker at Leeds' Grand Theatre in 1989. • War World – an in-depth look at the script originally intended for the 1989 stage production. • Cyber Leader David Banks dips into the TARDIS tin. • Tributes to the king of Doctor Who extras Pat Gorman and visual effects designer Richard Gregory. • Former script editor Andrew Cartmel remembers Happiness Patrol writer Graeme Curry. • A preview of this year’s Record Store Day releases. • Part Three of Herald of Madness, a new comic strip adventure featuring the Thirteenth Doctor and her friends. • How to dress like the First Doctor – along with his friends and foes. • Does the 1996 TV movie impress the Time Team? • The Blogs of Doom, audio reviews, previews, news, prize-winning competitions and much, much more! + Doctor Who Magazine Issue #537 is out 4th April, priced £5.99.